Of course Jonghyun was sad to say goodbye to London, and to Key&apos;s cousin who had been nothing but accepting and understanding of his relationship with Key, especially after the awkward incident in which she found them making out in her own living room. Key had spent over thirty minutes fussing over Ji-Hyun, making sure she was okay even though she had lived by herself for most of her life. Jonghyun eventually had to drag him out of her cozy flat, in case they missed their flight home back to Korea. "Bye!" Ji-Hyun called as Jonghyun grabbed his boyfriend&apos;s bag (as he was apparently "too tired" to carry it for himself) and disappeared down the hallway to the elevator. Key waved back before his cousin shut the door, and sighed happily to himself. "I knew you two would get along," Key commented as they got into the elevator. Jonghyun nodded, agreeing that Ji-Hyun was, in fact, very lovely and an easy person to talk to. "I&apos;m sad to leave," Jonghyun muttered, wrapping his arm around Key&apos;s waist. "Do you think we&apos;ll ever be able to come back to London?" 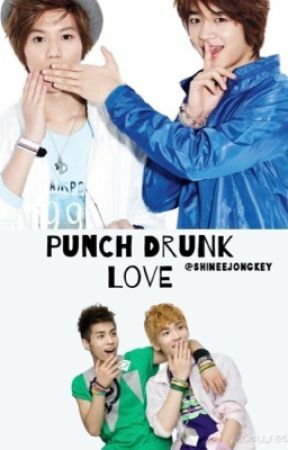 "We can ask the manager-hyungs what they think," Key mused, leaning his head against Jonghyun&apos;s shoulder. They had had a busy week of shopping, sightseeing and just generally having fun, but now that the short holiday was over, they were all exhausted and in dire need of a good night&apos;s rest. "Onew!" Key called, waving his hand in the air to get their leader&apos;s attention. Onew quickly spotted him and was soon by their side. "Where&apos;s Minho and Taemin?" Key asked, noticing that they weren&apos;t with Onew even though they had shared the same hotel building. "I don&apos;t know," Onew admitted. "They were right behind me about half an hour ago, but when I went to see if they were okay, they were no longer there." Onew noticed Jonghyun&apos;s odd look and quickly added: "But I&apos;m sure they&apos;re fine. They&apos;ll be back soon, I hope." "Well, I&apos;ll call Minho in a second. Everyone knows how terrible Taemin is with his phone," Jonghyun rolled his eyes and laughed. "He already lost it twice this holiday," Onew laughed along with the other two. "But each time, he found it down the side of the bed." "Speak of the devil," Key muttered grinning as Taemin and Minho came into view. They had just walked out of the public toilets - both looking dishevelled. "Did they look like that before they arrived?" "I--" Onew started, frowning to himself, but he was cut off when Minho yelled, running over to pull all five of them into a group hug. "Shut up!" Jonghyun laughed, pushing him away and sorting out his shirt which had been crumpled. "What took you so long? The plane leaves in an hour and we haven&apos;t even checked in." They all nodded in agreement and swiftly made their way over to the check-in desk. "You didn&apos;t forget your passport, did you?" Key joked, nudging Taemin to get behind him in the queue. Taemin tried to defend himself, but they others just laughed him off, leaving Taemin pouting. Minho wrapped an arm over the maknae&apos;s shoulder, shaking his head and whispering to him that they didn&apos;t really mean it. The SHINee boys soon had their tickets and were on their way back home. Onew sent a quick text to Ji-Min, hoping that she&apos;d have the time for him to go over to her small cafe and talk to her. Despite the tired state Onew was in, he was adamant that he would see Ji-Min before the day was over.